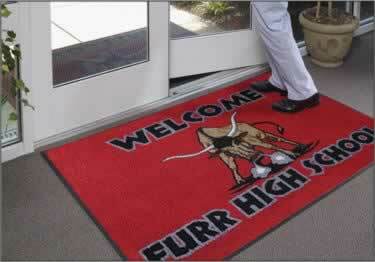 Offer a sincere welcome, make a bold statement, or provide a colorful message with the Classic Impression mat. Manufactured using cutting-edge digital printers with the ability to print virtually unlimited colors, the vibrant Classic Impression mats are designed by our team of graphic artists who can create 3-D images, reproduce the finest details, print very small letters, and even phase in colors to enhance any entryway or interior. Enhance any entryway or interior with an attention-grabbing, vibrant Classic Impression floor mat custom designed to your exacting details. For use in high traffic areas indoors or out. Durable and slip-resistant. Present any customized message across any entryway. Clear vinyl mat in a variety of types and sizes.